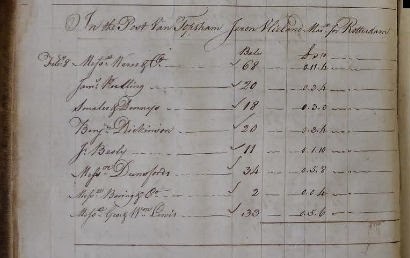 a photo of a page from a wharfinger's journal from the port of Exeter, (Reference Devon Record Office a1/4) which shows the cargo of cloth on the Post van Topsham on its sailing for Rotterdam on 8 February 1791. Baring & Co are from Exeter. Thanks to Peter Maunder for this great information. More about Jeroen Vlieland .